The American Bach Soloists Academy is held in the spectacular facilities of the San Francisco Conservatory of Music, in the heart of San Francisco's Arts district. Davies Symphony Hall (home of the San Francisco Symphony), the War Memorial Opera House (home of the San Francisco Opera and San Francisco Ballet), and Herbst Theatre (one of San Francisco's finest concert and recital venues) are just a three-minute walk from the Conservatory. Two primary public transportation hubs, linking to SF Muni and BART, are less than one minute away. And the upscale neighborhood of Hayes Valley offers a plethora of dining and shopping experiences for all budgets and tastes. The Conservatory's new location, opened in Fall 2006, contains state-of-the-art performance venues, classrooms, practice rooms, and teaching studios. 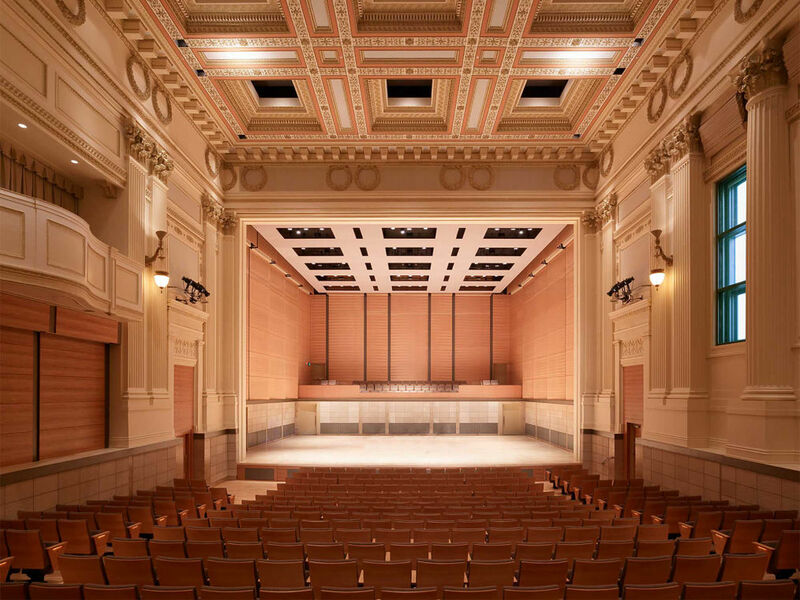 The Concert Hall is a dramatic space created in a renovated, historic grand ballroom, and accommodates audiences of up to 450 people. The extraordinary and intimate Sol H. Joseph Recital Hall seats up to 140 and is specifically designed for chamber music, small ensemble performances and recitals by faculty and students. The Osher Salon is a versatile jewel-box for student recitals, ensemble performances, opera staging and blocking rehearsals, classes, lectures, special meetings, and events, and seats up to 120. Some of San Francisco's most splendid public architecture can be found in the Civic Center area of San Francisco. The recently renovated, domed City Hall and the War Memorial Opera House epitomize Beaux Arts style, while the fan-shaped modern edifice of Davies Symphony Hall joins the new Asian Art Museum as the two newcomers in the neighborhood. Hayes Valley offers some of San Francisco's finest dining and lively after-concert pubs, cafes, and bistros. A few minutes walk to the west is the famed Haight/Ashbury district, the Castro, and a short walk to the south is trendy SOMA. For more information, contact our Academy Administrator. Send email or call (415) 621-7900.